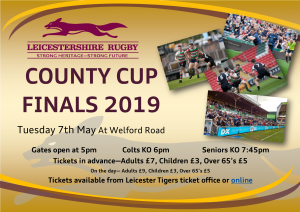 This years county cup finals will once again be held at Welford Road on Tuesday 7th May 2019. Following feedback from last years event, we can confirm that spectators will be watching from the terrace this year! Tickets are available as print at home or e-ticket or if you wish to have a physical ticket posted, there will be a £1.50 postage fee. E-tickets can be scanned at the gate from your phone or printed at home. Gates open at 5pm. Colts KO 6pm. Seniors KO 7:45pm. Parking is available on a first come first served basis at £5 per car. Bars in the Breedon stand will be open throughout and food will also be available from inside the stadium. We will be making presentations during the break between the matches for other county competitions that have taken place throughout the season, and also presenting a cheque to The Royal British Legion Poppy Appeal for fundraising throughout the year and following the 100 year memorial match. Here’s your link to purchase tickets now. Buy in advance to save a few ££££ and also so you don’t have to queue on the night.